The cashew cream is optional as you could substitute in mayonnaise, but I'm avoiding dairy so I turned to a raw food staple for a solution. Soaking raw cashews and then blending them creates a healthy cream that can be used in a variety of ways, including in desserts. This is an easy way to elevate a boring pasta salad and there's no reason to wait until someone's birthday to enjoy. 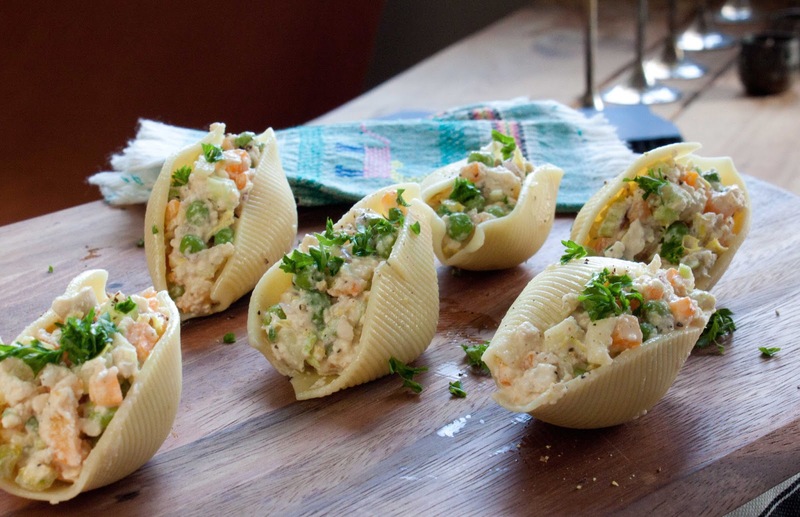 Start off any meal with these easy Fat and Happy cold stuffed shell appetizers. Fat and Happy Food Blog Tips and Techniques: The cashews need to soak overnight so begin the process the night before you will make the salad. Place the cashews in a glass bowl, cover with cold water and let soak overnight. Rinse the cashews, place in a blender along with one cup of cold water, the garlic clove, a dash of onion powder, paprika and cayenne, juice from half of the lemon and salt and pepper, blend until desired consistency is reached. You may need to add more water. I left mine slightly chunky to give the salad more texture. You can blend until smooth and even strain it for the smoothest option. Cook the pasta shells accorrding to package directions. Be careful not to overcook them, they should be al dente. Strain and rinse with cold water. Mix together the salad: add the onion, celery, pepper, peas and jalapeno with the cashew cream. Additional salt and pepper to taste. 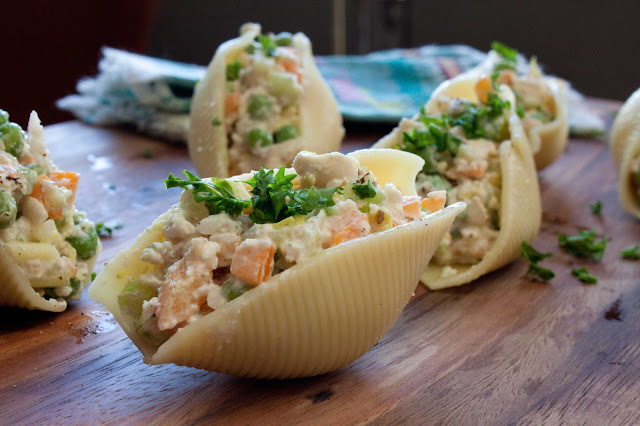 Stuff the shells with with the salad and enjoy. 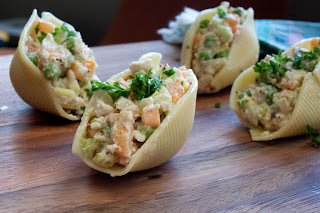 That said, the cashew cream sounds heavenly, and I am planning on making these as is. Thanks! Hi- Thanks for the comment. You make a good point about mayo not being daily; ideally I should have said I was avoiding the eggs [in the mayo]. Or I could have stated that I was avoiding fattening foods, that pretty much covers mayo. I'm excited to work with this cashew option more, seems the options are endless. Let me know what you think of it. I’m sure I’m not the only one that can sometimes get carried away when I’m out drinking with friends. I’ve been taking detoxicated hangover supplements for about a month now when I drink, and I honestly think they’ve been helping me keep my terrible hangover headaches at bay. Highly recommend. Want to know about what cures a hangover? Pay a visit to the website.